Manual therapy is an ancient art. Back in time Chinese monks knew how to cure with hands, restoring the functional activity of the human being. American Indians practiced manual therapy. Medicine men provided necessary medical assistance in case of dislocations or made spinal manipulations to adjust the movement of vertebral segments. Zaporozhye Cossacks apart from a head and a military clerk also had a bonesetter; they did not go on a military campaign without one. In Russia in old times there was a very peculiar method of curing musculoskeletal diseases: a patient was dragged under a fence and then his every bone and muscle was kneaded. Centuries old traditions of healing art using manual therapy were preserved and passed from one generation of bonesetters and healers to the other in order to cure people. However, in Russia the services of healers and bonesetters were officially banned for a very long time, manual therapy practitioners were prosecuted. Representatives of conventional medicine considered bonesetters and folk healers to be ignorant, narrow-minded non-professionals who could only hurt patients. Modern medical clinics with qualified personal pushed them out of life. On the other hand, a concern about a loss of a vast experience of generations of bonesetters and healers had aroused. Bonesetters and healers managed to preserve the knowledge of their ancestors, despite persecution and deserve our gratitude for that. The old traditions of healing art definitely should be collected and preserved while curative methods of alternative medicine are not completely forgotten. Nowadays, when a person gets ill, he goes to a general practitioner or family doctor who establishes a diagnosis, prescribes a painkiller and advices not to make any sudden movements. If that does not help, a surgeon offers to do an operation and then a long rehabilitation period follows. The operation might lead to partial disablement and a lot of pain. It used to be this way but today people are taking an interest in alternative methods, such as manual therapy and osteopathy, which can help even with serious illnesses. When I was a student I took a great interest in manual therapy, traveling around the country and meeting various healers and bonesetters. I was attentively tracking their performances and could not help wondering, admiring and worshiping those people who dedicated themselves to a great thing — to save humans from pain. 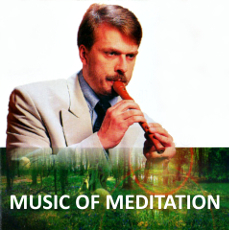 In one little town in the North Caucasus there was a healer who removed pain in a very mysterious way — he moved his knife around the sore spot. Once, a young man suffering from a sharp pain in his loin was brought to that healer. Any little movement caused him an enormous pain. So the healer took his sharp knife and started moving it around the man’s loin without touching it. The young man cried out and said that the pain subsided and that he felt heat. Then the healer pressed the man’s spine bells with his fingers and then with his hands. In a few minutes he asked the patient to stand up. The relatives who brought this young man to the healer rushed to help, but the healer stopped them and asked the patient to stand up himself. The patient started standing up slowly as he was afraid of pain but when he stood up he had a smile on his face showing that the pain was gone. I gave this example as I witnessed it all by myself in order to remind that there are things in this world, which are still unsolved mysteries. The healing art of bonesetters and healers needs a deep study to explore their techniques and methods which can be further used in medical treatment, observing strictly individual approach to every patient. Current experience of including some methods of bonesetters and manual therapists in the complex medical treatment shows amazing results. The talent of traditional healers including bonesetters is a gift of nature and in the old days they treated patients, returning them to health, relieving pain, having only this gift. Today this is not enough. Nowadays a person who has decided to devote himself to medical practice has to study for years. Even after obtaining a medical doctor diploma, he is just at the beginning of his studies, because every doctor explores his specialty for his entire life. A modern, well-educated doctor, knowledgeable and experienced in art of medical treatment, would not look down on healers, chiropractors and bonesetters; he would take advantage of their century old traditions of healing art. A combination of the latest achievements of medical science and the knowledge and unique ways of healing preserved in time could produce very positive results. People do believe in the old curing methods and belief is half the way to success. Osteopathy is one of the scientific schools of Western medicine. Back in the 4 century B.C. Hippocrates urged all the doctors to focus on the health of each individual: “Our nature is a doctor for our illnesses… Doctors have to perceive a patient like an integral organism in close connection with the environment”. Doctor Andrew Still, who practiced in America in the 1860s, was a true follower of this Hippocrates principle. He went through personal tragedy as he lost three of his children. This made Dr. Still to search for a new approach to cure illnesses. In 1874 Dr. Still formulated a concept of an osteopathic medicine — a new way of healing people. Dr. Still put together the fundamental principle of Hippocrates with his own theory of interdependence and interaction of the organism’s structures and functions. He was sure that a human organism can heal itself. Medicinal help should be considered as a corrective action with the help of healing manipulations. These manipulations applied on the spinal cord result in self-regulation of the central nervous system, which controls the activity of the whole organism. Andrew Still considered himself to be a mechanic of the human body who reveals the body’s own resources of recovery. His methods became very popular and osteopathy started to develop intensively, similarly to traditional medicines. About a 100 years ago (in 1892) the first school of osteopathic medicine was established in the USA (Kirksville, Missouri) and then in Britain. Osteopathy became popular in France a quarter century after it was invented. In 1898 students and graduates of the first American School of Osteopathy (now it is named A.T. Still University) started uniting in a special Association, which published a scientific journal entitled the Journal of the American Osteopathic Association. In US one could become an osteopath only after 4 years of studying in a medical school plus 3-8 years of clinical residency. All this implies hundreds of hours of theoretical lessons, studying basic sciences (anatomy, physiology, microbiology, pathology etc. ), special techniques and practice in hospitals. However, this structure, if it is not affected by any organic disease, may nevertheless not fully meet the needs of the function. The osteopath examines everything that surrounds this structure, as well as the relation of the content (the organ) towards the containing (the thorax) and also nearby structures (diaphragm and abdomen). As a result of the treatment the breathing function will be restored. It is simple. The positive result remains stable. This is achieved because the problem has been investigated thoroughly and the restoration process carried out competently. An osteopath is needed to help the patients’ organism to function normally, in order to relieve the person from health problems, which spoil his every day existence and which do not go beyond what doctors call functional disorders. Osteopathy is a way to restore as far as possible, body homeostasis, which depends on the normal functioning of all our organs. After all, it determines how we feel. In his practice, the osteopath uses primarily his head, i.e. his knowledge comes first, then the hands, which are at first a tool to detect abnormalities, and then become a tool to eliminate disorders found. But osteopathy is more than a set of techniques, as the knowledge and ability to apply these techniques do not allow wearing the title of osteopath, as well as the ability to handle the wound does not give the right to declare one a surgeon. Osteopathy, also, cannot be reduced to just manual therapy, as it differs from manual therapy in its philosophy, its approach to functional disorders, variety and delicacy of techniques. Strictly observing the treatment protocol, an osteopath, on the other hand, has constantly to mobilize all his abilities, skills, knowledge and reserve forces to bring his patient back to health. To become an osteopath is not easy. At first, one should develop his tactile sensation abilities in order to master palpation diagnostics. And second, the education of an osteopath includes becoming a general practitioner as well as learning osteopathic medicine philosophy, approaches and methods. The osteopathic diagnostics of disorders of the spine, joints of the lower and upper limbs, skull and posture. 1.​ Cranial osteopathy (manipulations on calvaria and on facial bones of the skull). 2.​ Hand manipulations on the spine (long and short leverages). 3.​ Manipulations on the limbs, which are carried out in the case of major peripheral joint disorders. Diagnostics is an integral part of osteopathy and is provided by the high level professionalism of doctors. A qualified osteopath can accurately make a diagnosis only by external examination and palpation of a patient, without X-ray inspection. However, sometimes the results of an X-ray are required to confirm an initial diagnosis in the case of complicated injuries, when fractures, cracks in the bones, bone pathology are suspected or if the diagnosis is unclear. Having a very high tactile sensitivity, the osteopath examines a patient by palpation starting from the spine. He identifies every displaced or painful spinal segment. Depending on the displacement and pain in a spine, the osteopath makes a diagnosis, taking into account nerve compression in a certain segment. For example, the disarrangement of the 3d and the 4th lumbar spinal vertebrae in a spinal (movement) segment gives sharp low-back pain, which is radiating to the extremities. It is usually assumed that lumbosacral radiculopathy can cause only symptomatic pain, but the practice shows that the hidden forms of radiculopathy are very common — they include any kind of disorders of organs of the small and large pelvic (colitis, hemorrhoids), gynecological diseases, frigidity and impotence, arthritis and arthrosis of the joints of the lower limbs, varicose veins, endarteritis obliterans, myofascial tensions, neuritis of the medial and lateral nerves as well as neuritis of the sciatic nerve and other disorders. Having found pathological changes the doctor starts a course of special osteopathic manipulative treatment. An example from the medical practice. A female patient: milkmaid by profession; born in 1956; resident of the suburbs of Moscow. The patient complained of a severe back pain. The pain was radiating in the groin and inner thigh. The patient also complained of constipation (sometimes more than 5 days). The lower limbs were puffy and swollen. Palpation revealed a dislocation of the lumbar vertebra with the distance reduction between the 4th and 5th lumbar and the 5th lumbar and 1st sacral vertebra. The patient was forbidden to lift weights and recommended to avoid leaning forward and to eliminate nervous stress. Osteopathic treatment was applied for the entire spine with the focus on the lumbosacral spinal cord segments using traction manipulations. After the 3d session of the procedures the pain began to subside. After the 5th session the patient was able to move independently. After the 7th session (second week of the treatment) there was no pain, the puffiness and swelling in the legs decreased, the stool became normal. The lower-back pain and the pain in the groin and on the inside of the thigh were absent. After the 10th session the swelling on the legs was negligible, and the constipation disappeared. Measurements showed a decrease in the thighs and shanks about 1.5 cm due to removal of edema. The subsequent control examinations demonstrated a stable improvement in the state of health of this patient. On the recommendation of a doctor, she moved to lighter work. Inspection six months later confirmed stable recovery. The cervical spine is the most difficult part of the spinal cord for diagnostic and therapeutic procedures, but its treatment by the method of osteopathy is the most effective of all the parts of the spine. Some chiropractic and osteopathic schools think that manipulations should be carried out only on the cervical spine, thereby emphasizing the importance of this part for the recovery of body functions. 1. The brain stem is lowered into the upper three cervical vertebrae. There are important brain centers — cardiovascular and respiratory. You can imagine how important the correct location of these cervical vertebrae is for the body. 2. Arteries. The two paired arteries — the common carotid and vertebral – are supplying our brain with nutrients. The vertebral arteries pass through the transverse foramen (lat. foramen transversarium) of each cervical vertebra bringing blood to a substantial portion of our brain (brainstem and parts of the cerebral cortex, which contain basic reflex centers). As a rule, ailments associated with headache, with an increase in cranial pressure, vascular spasms and general vascular insufficiency are connected with restrictions of the blood flow through these arteries. Thus, the impaired blood flow in these arteries could be linked to a misalignment of the cervical vertebrae (from 1st to 6th). 3. The cervical vertebrae provide a channel for the spinal cord, which connects our brain with the somatic nervous system. The bone structure of the neck itself is surrounded by nerve fibers and nerve plexuses. Taking into account these features of the cervical spine, you can imagine what kind of care and attention is required during manual manipulations on this part of the body. A muscle tension around the cervical vertebrae is important in the diagnosis of a disorder. Deformations in cartilage tissue of the intervertebral discs in many ways can lead to a nerves compression or vertebrae misalignment. Dislocated for different reasons vertebrae (an accident, a fall from a height, a sport trauma etc.) can result in a serious impairment of reflex activity of the organism. Minor deformations in the bone structure of the neck may appear due to improper body position during sleep, long sitting at the table with the head tilted forward, kicks and sudden head movements. The neck is a very vulnerable section of the human skeletal system! A female patient, 25 years old, worked as a shop-assistant in Tomilino. She came for a consultation as she suffered terrible headaches accompanied by sickness, dizziness, increased intracranial pressure, seeing spots, pain while lifting eyelids, irritability, drowsiness and apathy. The patient also complained about pain in her neck and pain while swallowing, pain in her upper limbs, especially in the morning, swollen arms and paraesthesia. She was having these symptoms for 4-5 months. An encephalogram showed that she had constricted vessels, dilated veins and impaired lymph circulation. An X-ray showed damage in the first and second neck joints. The patient could not refer to any trauma or accident linked to her health condition. She was prescribed a special care regime used for patients with injuries of the cervical spine. Manipulative treatment was performed at first on the lumbar and thoracic parts of the spine. Only at the third treatment session delicate manipulations were carried out on the cervical spine. The manipulation sequence was determined by the soreness of the joints of the neck. After the 5th session the patient noted a certain relief, the sickness and the dizziness ceased, by the 10th session the patient no longer had headaches and pains in her neck and hands. The treatment was continued and after the 15th visit to the clinic all the symptoms disappeared. The patient returned to work. Later on she maintained a healthy lifestyle, following all medical recommendations and advices to prevent the relapse of the disorder. Follow-up visits demonstrated that the health recovery was stable. Degenerative spinal changes due to osteoarthritis of the thoracic spine cause various symptoms of internal organs damage, but an accurate examination of the spine can reveal these problems. For example, problems with the 5thand 6th thoracic vertebrae can give raise to pain of different types in the heart area; problems with the 7th and 8ththoracic vertebrae can be responsible for impairments of the liver, the stomach and the functions of the intestine. Disorders of the thoracic spine could be diagnosed by palpation: any muscle tension around a certain spinal segment, soreness of a segment itself or of a corresponding joint indicate innervation problems due to nerve or nerve root compressions. Vertebra dislocations and deformations could be distinctly palpated and suggest past injuries of the patient. Damaged spinal segments can cause pathological reflex which complicates the recovery. A female patient: born in 1971; resident of Moscow; by occupation – an accountant. She had osteoarthritis of the spine and a pronounced radiculopathy of the thoracic spine. She complained about pain in her chest and difficulties with inhaling and exhaling. In long walks the patient was out of breath, with whistles and wheezing escaping from the chest. Especially severe breathing problems were accompanied by a pronounced sense of fear, pain in the interscapular region radiated to the area of the heart and the right intercostal space, as well as by pain in the stomach and epigastric region. Examination showed that she had a strong muscle tension in the area between the shoulder blades and a deformation of the 4th, 5th and 6th vertebrae. Osteopathic treatment has brought relief to the patient. Pain began to subside after the 5th session and after the 7th session the pain disappeared in the interscapular region, the intercostal space and the heart area. After the 12th session (3d week of the treatment) the examination of the patient showed that the pain in the 4th, 5th and 6th segments stopped completely. 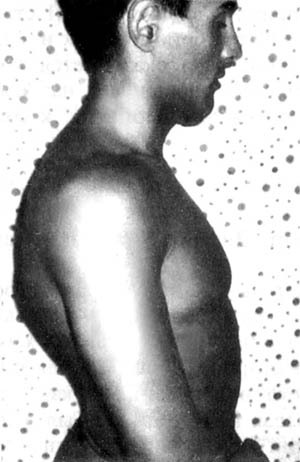 The muscle tone in the area between the shoulder blades normalized. The patient no longer complained about pains in the heart and epigastric regions. The patient was prescribed a special complex of physical exercises for home performance. The treatment regimen also included prohibition to lift weights and to work for a long time sitting at the table leaning forward. In a year, an examination of the patient demonstrated almost complete recovery. Pain only appeared in the area between the shoulder blades after the load on the spine, when the patient failed to comply with the doctor’s recommendations. One of the main objectives in osteopathy is the diagnosis of different damages in the joints of the extremities and methods of their treatment. 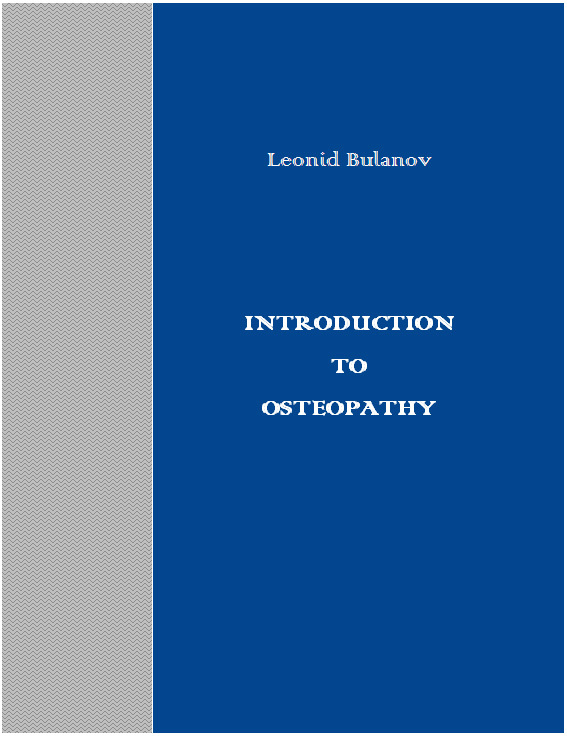 In the medical and popular literature, this topic is not covered well, although it constitutes a significant part of osteopathy. Osteopaths make special manipulations on the joints stepwise. At first the entire spine is treated, and especially the segments, which are responsible for the innervation of the affected joint. Afterwards, manipulations on the affected joint itself are performed in a form of patting, using a special percussion technique as well as a myorelaxation treatment by shaking and stretching the limb. During examination of the affected joint several parameters are taken into account, namely the anatomical features of its structure, the muscles mass surrounding the joint, the range of motion of the joint and the results of X-ray inspection. The complexity of the diagnostic techniques and therapy aimed at the restoration of the joint function directly depends on the complexity of the structure of the affected joint. Joints differ by the form of connection of the surfaces (pivot, saddle, planar, hinge, ellipsoidal, condyloid, spheroidal etc. ), by the number of axes that define the movement of the joint (uniaxial like hinge joints; biaxial like ellipsoidal and saddle joints; multiaxial like spheroidal joints) and by the tissues they are composed of. The motions in the joints are made around the three planes — sagittal (adduction and abduction), frontal (flexion and extension) and vertical (rotation inward and outward). Considering the anatomical and physiological features of limb joints is really important for making a reliable diagnosis. Sometimes the patient’s joints are so painful that it is impossible to conduct therapeutic procedures. In this case, other forms and methods of therapy are selected (acupuncture, mild massage), or no specific manipulations on the joint are done at all at this stage of the treatment. A male patient: born in 1956; resident of Voronezh; occupation — a coach, in the past a football player. He complained about pain in his knee joints. He was observed and treated in the local clinic in the community for a long time, but did not feel any better. The results of an X-ray inspection showed that he had an arthrosis of the knee joints of the second grade. A physical examination revealed significant limitation of motion in the joints as well as swelling around them, indicating a chronic inflammation of the joint capsule. There was also tenderness to palpation in the lumbar part of the spine. The prescribed treatment included manipulations on the articulations of the entire spine together with the knee joints. The patient was recommended a reduced movement activity regime, which was lifted after the 5th treatment session. After the 7th session the pain in the knee joints began to decline, the mobility in the joints increased. After the 10th procedure the pain on palpation of the spine and knee joints was not detected anymore. After the 12th procedure the patient was able to move freely and squat easily. At my suggestion, in the future he performed squats up to 25 times a day as a home care treatment. The arms play a very important role in human life, thus diseases of the upper limbs are very serious and difficult to tolerate by patients. Any tension or soreness in the muscles around the shoulder, the elbow or the joints can indicate a possible inflammation in a joint. The limitation of mobility either passive (when movement is performed by a physician) or active (when movement is made by the patient himself) suggests the severity of joint damage. Diseases of the upper limbs are directly connected with the disorders of the cervical spine, in the same way as a disease of the lower extremities is associated with disorders of the lumbar spine. In the everyday life we often forget to move, sit, lie or lift heavy things in the right way. For example, those of us who walk hunched over with a lowered head, strain the muscles of the shoulder girdle. As a result, overstrain occurs, leading to a chronic soreness, which, in turn, affects the joint. Later an inflammation begins in the joint, develops by involving the joint capsule and results in constant pain. With time these processes can cause the development of a serious illness called arthrosis. One of the most severe diseases of the upper limbs – parasynovitis – is related to the use, overuse and pressure of soft tissues. We should remember that occurrence of the diseases depends on our lifestyle. A female patient: born in 1954; resident of Novosibirsk; occupation – a typewriter. Diagnosis – a scapulohumeral parasynovitis accompanied by an autonomic nervous system disturbance. The patient complained about a severe pain in the right shoulder joint, neck and the top of the right shoulder. She was not capable to do her work as typewriter. She had difficulties to abduct the arm. The examination using palpation and percussion revealed rather intense pain. At the initial stage of the treatment, manipulations were very mild. The upper limb manipulations included only circular movements and traction. A mild massage during 1-2 minutes was applied to the shoulder girdle. The pain started to subside only after the 8thtreatment session. After the 12th session sleep was restored and the patient could carry out some homework using the affected arm. The pain in the shoulder joint, the top of the shoulder and the neck disappeared. Procedures were continued and after two weeks the patient was found to be able to return to work, although a limitation of the mobility of the arm prevented her from returning the work of a typewriter. The patient was prescribed a special regime and a sanatorium-and-spa rehabilitation. There was no relapse of the shoulder joint disorder. 1.​ A straight vertical position of the trunk and the head. 2.​ The same level of the blades in the absence of their excessive divergence. 4.​ The physiological lines of the spine are well defined and have an evenly wavy appearance. 5.​ The straight line of the spinous processes. Any deviation from a normal body shape or from a correct interrelation of its separate parts – head, trunk, pelvis and limbs – indicates a posture abnormality and a deformation of the spinal cord. Depending on the axis of the spinal curvature, different deformities such as kyphosis, scoliosis or lordosis could be diagnosed. Osteopathy effectively deals with diagnostics and treatment of these disorders. Practice has proved that osteopathic treatment can help to restore health in many cases where other approaches were helpless. The spinal curvature in a case when there are no structural changes in the spinal vertebrae (for example, in a case of scoliosis of first or second grade) can be cured using osteopathic manipulations. I was approached by a mother and her 12 years old daughter. The girl was diagnosed to have grade II scoliosis. 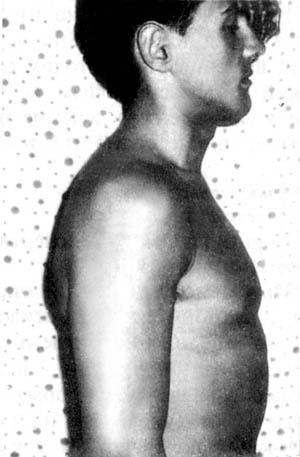 Fig.1 A patient with a posture deformity (kyphosis): a — before osteopathic treatment; b — after a treatment course. the left side, the left waistline was smoothed, an initial stage of the pelvic curvature and consequently the right leg was shortened by 2 cm. The patient was prescribed a program of physical exercises aimed at correcting the muscles of the back, and a course of osteopathic manipulations. The osteopathic treatment course lasted for 4 weeks and consisted of 12 sessions. At the end of the treatment the girl’s head and neck position took the midline, the shoulders returned to an equal level and the angles of the blades became on the same level, respectively. The chest line straightened by 15 cm, the lumbar spine held the midline and the waistline looked symmetrical. There was no longer pelvis curvature and the difference in the length of the legs. From the beginning to the end of the treatment course the patient was measuring her height. 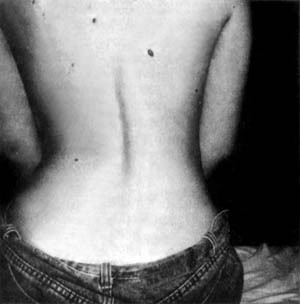 The girl’s height increased by 3 cm as a result of the scoliosis treatment. The patient was instructed to continue the physical exercises and to repeat the course of osteopathic manipulations in 2 weeks. After the second course of osteopathic treatment the scoliosis could no longer be diagnosed. An inspection of the patient two years after the treatment showed that the recovery was stable. Certainly, scoliosis is a serious disease. It manifests as a muscle disorder caused by the back muscle contracture due to a tension of some muscles and a relaxation of others. 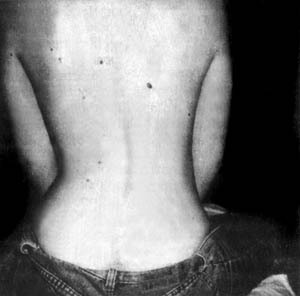 A complete understanding of the appearance of scoliosis and its progression has not been accomplished. Nevertheless, one aspect of its development should be regarded especially. According to Nobel Prize laureate physiologist Ivan Pavlov, our posture and other movement skills should be considered as a certain dynamic stereotype gained during a personal development and upbringing. Generated in the process of psychomotor development and training, conditioned reflexes for the maintenance of a correct posture are formed on the basis of inborn tonus reflexes — so-called Magnus & De Kleijn reflexes. The formation of a posture is a very important aspect of a psychomotor development. Good posture is not only aesthetic, but also of great physiological significance. Creating the best conditions for the functionality of the whole organism, it ensures the correct position and the proper activities of the internal organs, especially the heart and lungs, leading to the least consumption of energy in the work, which significantly improves the working capacity. Therefore, the formation of a child’s posture should begin with the first days of its life. Parents should care about its correct position in the baby cot, and then help children when they start to sit and to walk to do it properly, to train them to keep their back and head straight. Fig.2 A patient with scoliosis: a — before osteopathic treatment; b — after a treatment course. Fig. 3 A patient with kyphosis and lordosis: a — before osteopathic treatment; b — after a treatment course. The formation of a posture goes along with the formation of the brain laying the foundation of human health. According to neurophysiologist A.A. Ukhtomsky, the cerebral cortex, through the cerebellum, manages our posture in order to manage our motorial behavior. The time, when the skeleton is formed, has a great importance for the further proper functioning of the musculoskeletal system of an adult. The right way of sitting at the school desk and doing homework, the bed of a child and different game activities, the right kind of sport — all these factors play a key role in the formation of the posture. One of the most advisable kind of sport for posture formation is swimming. Muscle relaxation, which is provided by water, and swimming as physical exercise yield effective strengthening of muscles, ligaments and bones. Sometimes, when properly chosen methodology is used, swimming even can help in correcting an impaired posture. Thereby it is particularly important to have a clear organization of the upbringing process of children and adolescents, taking into account all available knowledge about the central nervous system activity, in order to help young during the period of accelerated growth and development. A 16 years old patient came for a consultation with his parents. He complained of a posture deformity. His stance had following characteristics: hunched back, protruded shoulders, head and neck were in front of the trunk, the chest was deformed due to a kyphosis of the thoracic spine. The rhythm of breathing was disturbed and the boy had a dyspnea after long walks. He also had increased body weight. The patient was prescribed a special complex of physical exercises and osteopathic manipulations aimed at correcting the posture. This therapy was followed by swimming sessions, which had a restorative effect, necessary for the proper formation of the body. In one year after the treatment the boy did not suffer from kyphosis or any other posture disorder. The dyspnea disappeared, the weight became normal. The parents were encouraged to ensure that the boy did not lift weights in excess of the natural load on the joints. Weightlifting at this age without a qualified coach can significantly damage the development of the musculoskeletal system, particularly destroy the emerging cartilage of the bones and contribute to the development of different disorders. A properly selected range of therapeutic exercises will strengthen the child’s body. Corrective physical exercises should always be practiced with due attention to the hygienic regime and using natural factors such as fresh air, water and sunlight, in order to improve the vital functions of the organism. In chapter 6 of this book seven special exercises of corrective gymnastics are described. They are recommended for the prevention of incorrect posture and spinal deformities as well as for the treatment of the later, including guidelines for their use. The human head is the part of the body with the most complicated anatomical structure. Its bone basis is the skull, which consists of 29 bones. Anatomy divides it into two parts: cerebral and facial skull. Diagnosis in cranial osteopathy consists of the determination of the shifted skull bones, if any, and finding skull deformities. Diagnosis is made by palpation or by visual inspection. Deviation of the bones of the skull is determined based on the vertical midline and the horizontal line drawn across the glabella with the help of a ruler or a measuring tape. The distances between the cranial sutures and between different points of the facial bones of the skull are measured as well. The relative positioning of the head and the trunk is estimated. Palpation of the skull is carried out starting from the scalp, looking at any sore spots on the calvaria, possible damages due to traumatic injuries (concussions, bruises, and bumps). The diagnosis of cranial disorders belongs to a very difficult section of Osteopathic Medicine and is largely dependent on the physicians experience, his practice, the knowledge of human body anatomy and physiology. It is natural that the displacement of the bones of the skull can cause compression of the cranial nerves (in Latinnervi craniales). The diagnosis of such disorders includes palpation around the points where the nerves leave the skull and recognition of the symptoms of inflammation. All osteopathic manipulations on the skull and facial bones should be carried out very gently. Only a proper performance would give a positive therapeutic result without undesirable side effects. A patient from Murmansk born in 1943 complained about severe headaches, high blood pressure, contusions accompanied by hematomas on his head. X-ray examination did not reveal any changes in the bone structure of the skull. Tension of the neck muscles suggested some damage in the neck vertebra. After a course of gentle cranial osteopathic manipulations, combined with careful manipulations on the cervical spine the patient’s health condition returned to normal. Patient A., born in 1961, resident of Moscow, by profession a waitress, had an inflammation of the right supraorbital branch of the trigeminal nerve. Pain had a pronounced character and was enhanced by a headache and pain in the neck. The patient denied having injuries. Physiotherapy and pharmacotherapy did not give any results. The patient was prescribed a course of cranial osteopathic manipulations, which were carried out step by step on the vault of the skull, and then on the facial bones of the skull. Osteopathic manipulations were also performed on the cervical spine. In addition to the treatment course the patient was prescribed to have rest. After the 5th procedure the inflammation of the right supraorbital branch of the trigeminal nerve began to disappear. There were no more headaches and pain in the neck. After the 10th procedure (2nd week of treatment) the pain at the spot where the nerve leaves the skull stopped. The treatment gave a positive result. In the diagnosis and treatment of disorders by methods of cranial osteopathy physicians are guided by the findings of Dr. Sutherland. He introduced the concept of primary respiration. By practicing osteopathy Dr. Sutherland observed rhythmic motions of the bones of the cranium, which he connected with cerebrospinal fluid circulation, suggesting that cerebrospinal fluid circulates with a certain pulsing. And the purpose of this ability of the skull bones to oscillate is to ensure pulsating circulation of the cerebrospinal fluid. The pulsating cerebrospinal fluid plays the same role for the tissues of the head and spine which the lungs play for the whole organism. It nourishes the brain tissue supporting its vital functions. And any minor limitation of this bone mobility disturbs the fluid circulation. Certain parts of the brain are malnourished and operate below the optimal level. In addition, compressed bones of the skull are pressing on the sensitive cranial nerves, and this has a negative effect on the entire body. Depending on which nerve is affected, a person may experience reduced hearing and vision, muscle spasms occurring in the neck, back and head and causing pain, dizziness, breathing difficulties and even gastric disorders. Although the tensions are intracranial, i.e. they arise in the cranial vault; the spine plays here a significant role. Thus, a bad pose can strain muscles and ligaments of the neck, which, in turn, can limit the movement of cerebrospinal fluid to the head. Tension in the muscles and ligaments of the head, neck and trunk can obstruct breathing. In this case, treatment of a respiratory disorder should include a correction in the area of the back. Osteopaths believe that often the cause of chronic headaches, pains in the neck and back due to muscle spasms is, first of all, the difficulty of the circulation of the cerebrospinal fluid and the limited mobility of the cranial bones.